Color Me Happy...: Ice, Ice Baby! 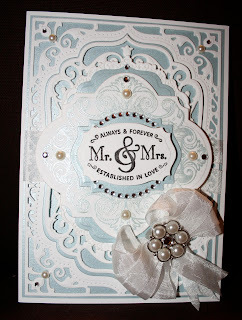 Actually, the title refers to the ice-y blue shimmer card that I used for the following wedding card. Please bear with me with regards to all the wedding cards that I have been posting. My daughters' have required several lately and I still have two more wedding cards and an engagement card to go! Anyways, I really love this particular card. It uses one of my favorite JustRite Stamps paired with a favie Spellbinder's Die combo. 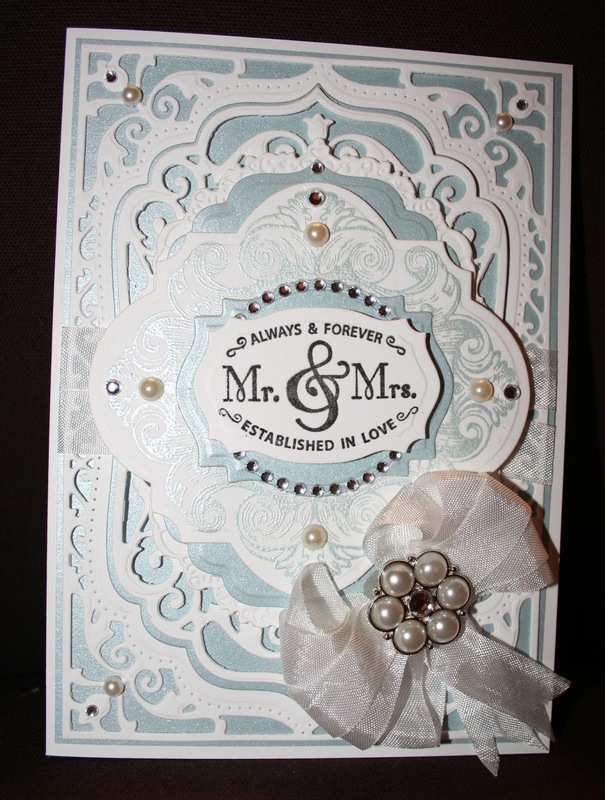 I decided to create an elegant, "cool and crisp" looking card using 120 lb white cardstock and shimmer blue cardstock. I love the results! I apologize for the high shine on the photo.....I haven't managed to get that under control when using a shimmer cardstock or a pearlized embossing. This particular embossing powder is great....it is a "pastel" powder which changes any color ink you use to the "pearlized pastel" version of that color! Also, here is the inside. So gorgeous, Sheila! Love the pretty layering and beautiful, shimmery blue! A Sheila beauty! Your style is wonderful! Stunning Sheila. What a elegant card.